One of the easiest and most popular ways to save money is to grow your own food. However, you can save even more money by making your green garden and lawn a little greener. Here are some eco-friendly ways to put your green thumb in action. Let’s start with your lawn. Investing in a manual or reel lawnmower can save you money in a number of ways. Since these mowers have no engine, you don’t need to buy gas. And while you may need to lubricate the moving parts once in a while, you’ll use far less oil than you would with a gas-powered model. Fewer moving parts means fewer things to fix or replace too. Feeling skittish about pushing a manual mower around your yard? Don’t be. Today’s models are much lighter than their predecessors and are generally cost less to purchase–often 30% or more. The clippings make a great fertilizer for your grass since they're cut so fine, which saves you even more money. If you have a larger yard, a manual might not be practical. However, an electric mower is still greener than a gas-powered model. If you have the gumption, you can build a solar powered mower. A rain barrel is a great money saver, as both your lawn and garden require plenty of H20 to stay healthy and green. Rain barrels are usually installed at the end of a home’s downspouts and can collect up to 60 gallons of water. Installing multiple barrels can really save you in the long run. You can collect upwards of 200 gallons of water from a quarter inch rainfall, depending on the number of barrels you have. Check with local officials about the use of rain barrels before you purchase one, as some communities restrict their use. While the primary purpose of composting is to reduce the amount of garbage that winds up in landfills, the practice can put a few cents back in your piggy bank. This is especially true if you have a garden. Compost is a good supplemental fertilizer, and makes great mulch. 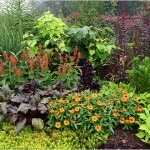 Mulch helps reduce the number of weeds, which in turn makes for healthier plants. Before you pitch the unwanted parts of those homegrown veggies, be sure to save the seeds. Stored properly, they can last for several years. Bugs are irksome not only to gardeners, but to anyone who wants to enjoy the outdoors. It’s tempting to use pesticides, but who wants all those dangerous chemicals around? You can control those irritating little creatures in a number of earth-friendly ways. One is to make your yard a hangout for birds. Birds eat a lot of bugs, and they will happily snack on old bread, or other crumbs from your kitchen. For a fun craft activity you can do with your kids, make a bird feeder out of discarded items such as an old a soda bottle, unwanted book, or simply look around and see what you can put together. You’ll help keep trash out of a landfill and make the birds a little happier. Don’t have space to plant a garden? See if there is a community garden in your area. These shared spaces save money in lots of ways. As with a garden in your own yard, you’ll save money by growing food for yourself. A community garden may also let you share resources such as tools, water, and supplies. These gardens increase neighborhood property values, as they are often found on plots of land that have fallen into disrepair. The far reaching effects save the community as a whole, by increasing green space, decreasing residual heat from pavement, and reducing crime by eliminating abandoned buildings and overgrown vacant lots. Check 'n Go is the 4th biggest consumer financial service institution offering check cashing and online payday loans in the United States. As a founding member of the Consumer Financial Services Association (CFSA), Check 'n Go has always been committed to responsible lending and works with legislators to improve the credibility of the cash advance and auto title loan industry. Check 'n Go has check cashing and payday loan locations in 28 states, with online locations in an additional 3. “Conserve Water with a Rain Barrel.” Hgtv.com. Web. 14 March 2012. We just started a garden! Veggies, fruits, flowers, and bushes! They're so beautiful right now, and I can't wait until they're in full bloom. I especially can't wait for the evergreens to grow! I have had a garden the last few yrs but this year I'm doing the composting from kitchen scraps. I think it's a great way to use garbage. Can't plant in the ground here for a few more weeks til the danger of frost is past but I am soooo ready! OH what a great article! I was thinking about doing a rain barrel this year….I didnt realize that some communites would restrict them. Wow….I guess I better check here first!